You mission, should you choose to accept it: Break into an enemy base, send the base's coordinates to a local artillery emplacement, and get the hell out. The layout of the level is good, and has been well divided between the objectives, although there are quite a few bottlenecks. There are also a couple of parts where your team will get sniped to the floor, on 90% of your tries. Architecture is good. The indoor section sports a variety of different architectural styles with smooth transitions. The level has been well lit. Every area of the level has been lit appropriately. The texturing is also good, but there are a couple of places where a little more work was required. Especially in the long hallway. A lot of the indoor parts are very well textured, as is the outdoor area. Sound effects have been used well all over the level. The radar/sonar sounds really stick out (in a good way). A good music track has been chosen too. The bots played very well. In both attacking and defending roles. They did everything well, including sniping. There were only a couple of minor glitches, but nothing big enough to affect gameplay seriously. The items are placed well, and reflect the gameplay of where it's placed. I think it was a bad idea to place a sniper rifle at the start though because it's incredibly easy to defend by just sniping. A shield belt has been placed near where the attacking team start, which begins to level things up, but nowhere near what's required. Gameplay is very good. The level combines a good mix of long range, close-quarters, and z-axis combat. Against real people, you'll find that the sniper rifle gets overused because the level allows for that. Other than that, the gameplay is great. I especially like the idea of the prisoner. When you complete the third objective, a prisoner emerges from his cell. At first he's harmless because he is unarmed, but if he gets his grubby hands on a weapon, he'll start attacking players on both teams. He even respawns. It's a very nice touch, and works very well. 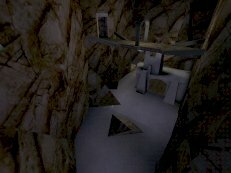 The hardest part of the level is when you exit the long hallway. You exit a 4ft wide passageway, in front of the entire defending team, whom all have sniper rifles, on a specially made sniper platform. There's also an automatic turret there to stir things up even more. There is no other way around, which is a shame. To make things even worse (if that's possible), the other team snipe from behind a wall that only they can see through! That part was a very bad idea, as the attackers game more or less ends there if you're playing against good opposition. There are a couple of careless errors that could have easily been fixed. Firstly the briefing and 'objective complete' statements have incorrect grammar. I know I probably sound like an English teacher, but things like "Coordinates are send" could have been very easily fixed. Secondly, as your team exits aboard the helicopter at the end, some of the incoming artillery hits the helicopter as it takes off. This again, could have been fixed easily, with a longer time delay. In conclusion, this level still manages to be a very good playing experience, in spite of a couple of blatant errors with the gameplay. Sure, some parts are hard, but the difficulty adds to the sense of accomplishment when you actually complete the objective. Bots and real players alike will take advantage of the loopholes, which will make life extremely hard for the attacking team. I would imagine that this level would be better for net games rather than LAN games, given it's size and number of objectives. For players who don't mind being gunned down loads of times. A good level, despite the errors. That good in terms of gameplay. For people who think sniping is cheap. As good as other assault levels. Make life easier for the attacking team. Include multiple routes to complete an objective. AS-OceanFloor is a very good example of this. Try not to 'promote' over sniping. Looks like a fairly good map. Like stated above, grammar errors are simple to fix. Multiple routes would be nice, and the prisoner idea is neat. A verson 1.3 should be made to meet my *ridiculous* demands. If u make one with multiple routes, youve got my download and score. tis lvl ownz.Ok not that ownz but i love it ! Very easy to defend. for ten minuets i just stood on the bridge and sniped the bots as they ran under me. still, i did enjoy the map overall. Actually I came across that prisoner only once killed it when he started to fire and did not see it since. Still good map. However easy to defend. A very cramped level, making defending a little easy. The prisoner was a neat idea. The map could have been polished a bit more by fixing grammatical errors in objectives, and also by fixing the ending sequence (escape helicopter gets hit by artillery). Other than that, good job. Not a bad map, but corridors are pretty narrow the entire map.